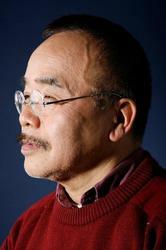 Maruyama is a 40-year veteran of the animation business. Born in Shiogama, Miyagi Prefecture, he graduated Hosei University in 1963, and soon after, he found work at Mushi Production as an animator. In 1972, Masao Maruyama founded Mad House with Mr. Sugino, Mr. Hata, and others. In the late 1980s and early 1990s, he also did production design on several films. In 2002, Maruyama was awarded the "Special/Lifetime Achievement" Award at the 7th Animation Kobe in recognition and honor of his contributions to the industry. He was the first producer to be given the award. As the main producer and studio head of Mad House, Maruyama is personally responsible for green-lighting new projects. Some of his many projects include Ninja Scrolls, Chobits, Card Capture Sakura, Barefoot Gen, and Deathnote. Maruyama has also overseen production on such popular films such as Paprika and The Girl Who Leapt Through Time. In 2010, Maruyama served as the executive producer for an anime project based on the TV show Supernatural, entitled Supernatural The Animation.